...Monday can be quite a challenge for adults, let alone children. Children process these things differently. They may be asking difficult questions and parents may need suggestions to help discuss what happened and address their concerns. 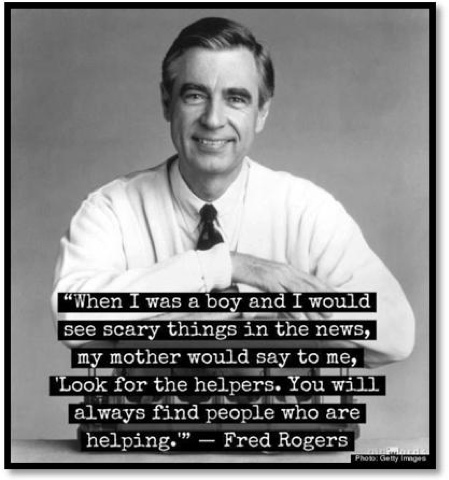 Fred Rogers from the long-running TV show, Mr. Rogers was quoted as saying, “When I was a boy and I would see scary things in the news, my mother would say to me, ‘Look for the helpers. You will always find people who are helping.’” That is good advice from the wise Mrs. Rogers, but what if your children have questions and need more? Below are some helpful tips from Child Psychologist Dr. Phyllis Ohr, for Press4Kids’ News-O-Matic, the first educational, news app for children 7 to 10 years old. Dr. Ohr is also the Director of the Child and Parent Psychological Services Clinic at Hofstra and the Assistant Director of the Clinical Psychology Doctoral Program. 1. When the event does not personally affect the child, reassure them that everything is okay with the people they love and that nothing has changed for them. 2. Be sure to stress to children that if they do have questions to ask parents, teachers as well as friends. Other children having the same feelings may be comforting. 3. Begin by giving the child a brief synopsis of what happened by using age appropriate language. Ask if there is something they want to know more about or if they need something explained further. If so, stick to pointedly answering their question or clarifying. Do not add on or digress. 4. Do not assume the news will make children feel a certain way. Ask if they know how they feel, but stress that kids feel all different ways when they hear important news and sometimes do not know how they feel or do not feel anything which is okay. However, if children are affected by it, it is their own feeling. Reassure children that no matter what they are feeling, their feelings are okay. 5. If they are upset but don't want to talk, suggest a fun activity for distraction or help them use calming skills like playing, drawing a picture or writing a story. These activities help release any upset feelings and make children feel better. I am participating in this campaign on behalf of Child's Play Communications. I received no compensation for sharing this information. I do so on my own accord, as I feel this information would benefit my readers. Wonderful tips and suggestions Diana and thank you so much for sharing these here, especially after the Boston Tragedy. Right now, I'm kind of torn between the young man who was influenced by his big brother and the child he killed. Should we be more understand for kids like him and Malvo(the D.C. sniper)? I have to keep asking myself, what is just. These are really good tips. I'm going to share this on my page.